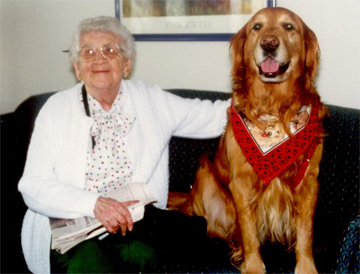 Animals in a private home, residential unit or healthcare facility may protect against loneliness and depression. They may add a sense of safety, companionship and protection. They may encourage physical activity and social interaction. They may be the substitutes for absent children, and stimulate innate nurturing responses to another living creature. The responsibilities and daily rituals of care may provide a touchstone of reality. They are socially-acceptable conversation pieces and opportunities for touching. All of these attributes, and more, can be applied in a therapeutic context. We see more people in a day than our ancestors saw in the course of a lifetime. Where interpersonal relations are often problematic, complex and laced with anxiety, interacting with a safe and friendly pet can be a peaceful, non-judgmental, stress-free reminder of the healing power of nature. Unlike human interactions, pets are a source of comfort that can be scheduled on demand. Pets may be a reality check and a “clock,” providing a sense of order and a daily ritual. They may give us a baseline of animal behavior against which we can compare our own troubles and put our own lives into perspective. Pets can contribute to the development of trust, self-esteem, ego strength, confidence, and attachment to people. They can improve our mood, take our mind off our troubles for a little while, and reduce anxiety, agitation and sadness. And they foster healthy interactions with other people: a pet is a conversation waiting to happen.